In my last two postings I concentrated on the Bukovynian chemise. 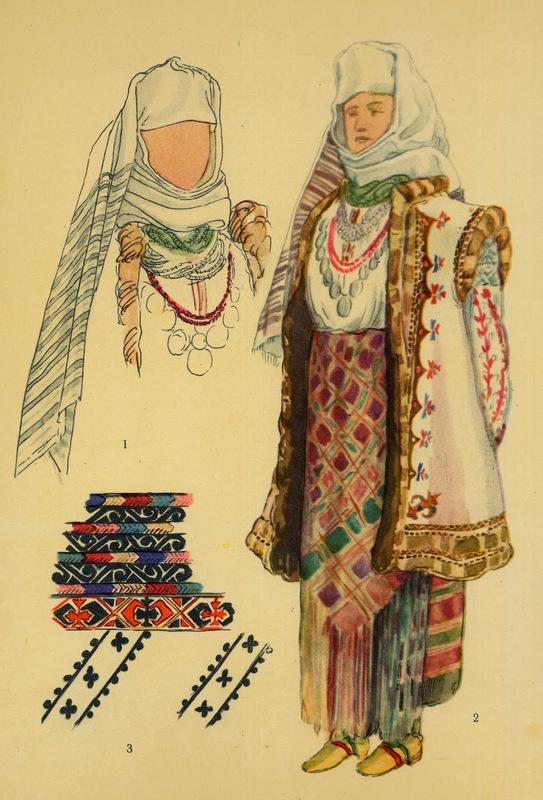 Today I will talk a bit about the overskirts of the Bukovynian costume. 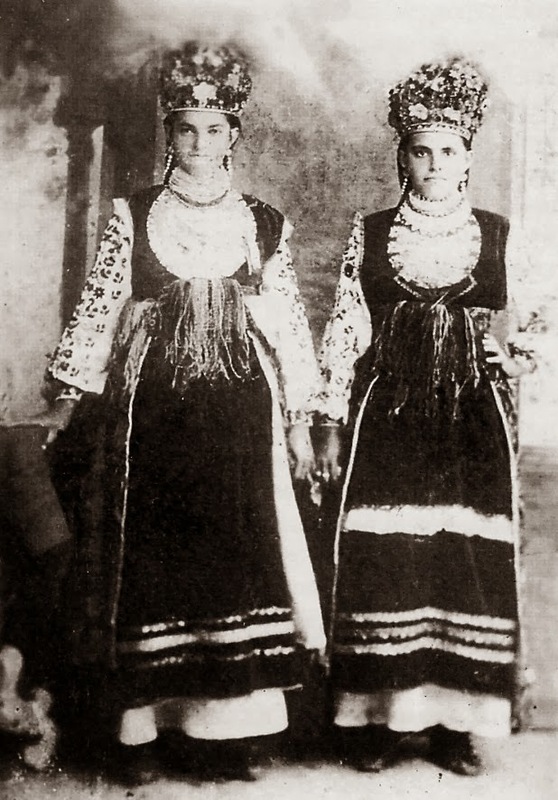 I have already mentioned the Obhortka [Horbotka], which is the oldest form of overskirt used in Bukovyna. In some places it continues to be part of the festive costume to this day. The word 'obhortka' literally means 'that which wraps around', and horbotka is derived from it as a sort of folk dyslexia. Horbotka is admittedly easier to say. 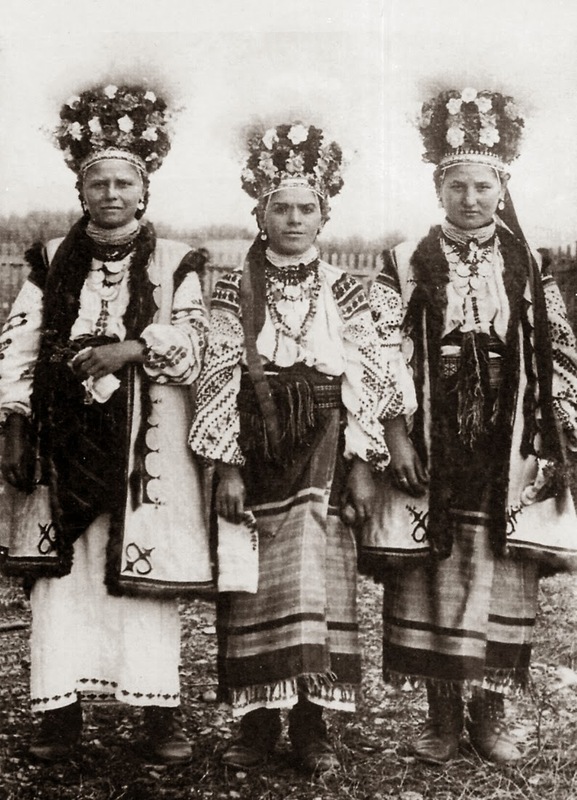 The two girls in the center of the above photo are both wearing obhortkas, the one on the left with the left corner tucked up, and the one on the right with both corners tucked up. 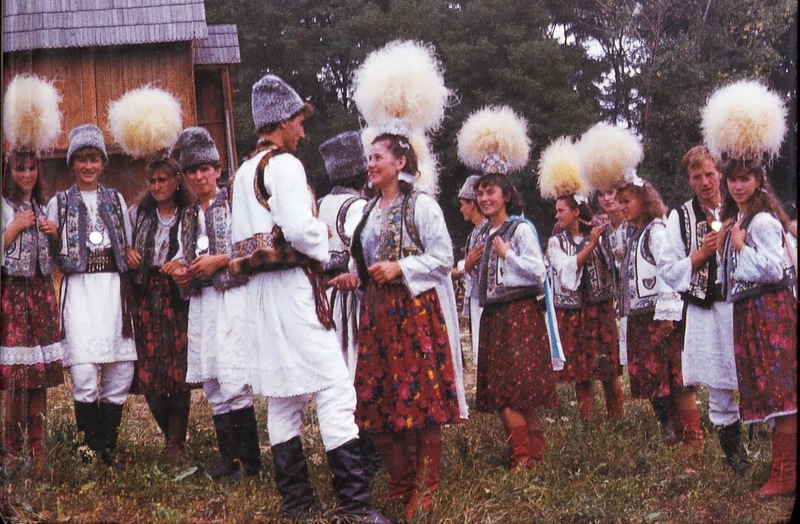 This is the old style of obhortka, which wraps around further than they tend to today. Often today the hem is shortened as well, under the influence of general fashion. You will notice that the woven ornament consists of very narrow, wide spaced stripes. the middle part, which is worn in back, is plain black. 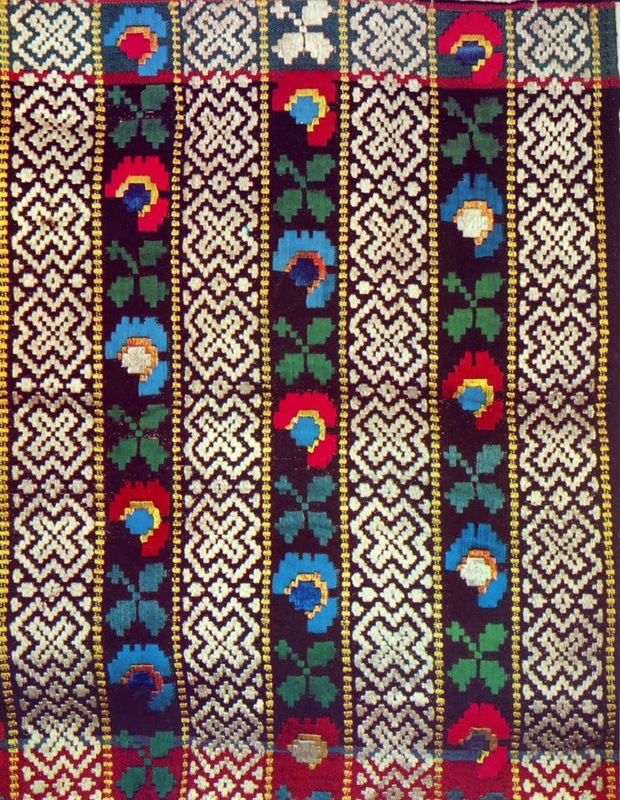 The obhortka is woven of wool and is very heavy and stiff. This is why at least one corner is gernerally tucked up, so as to provide freedom of movement. 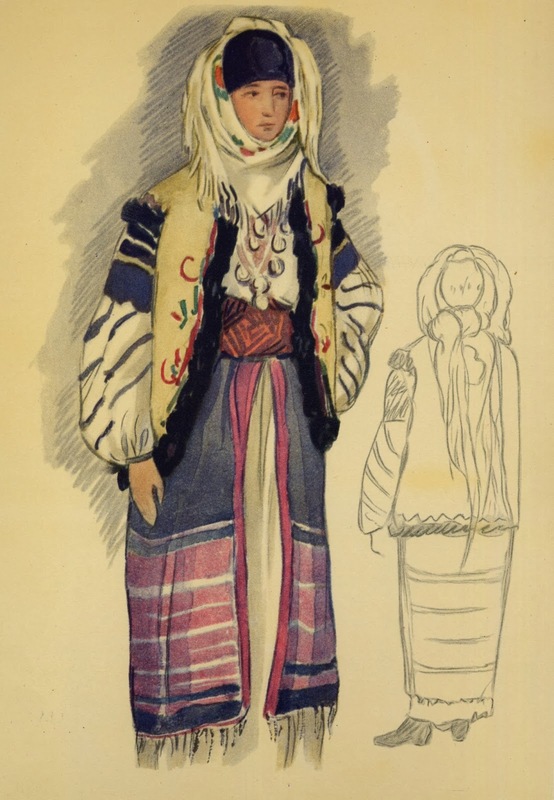 Jan Brett, in her illustrated version of the Ukrainian folk story 'The Mitten', draws this costume, but has the obhorta in a soft material which drapes. This is one of many incorrect details of her drawings in that book. 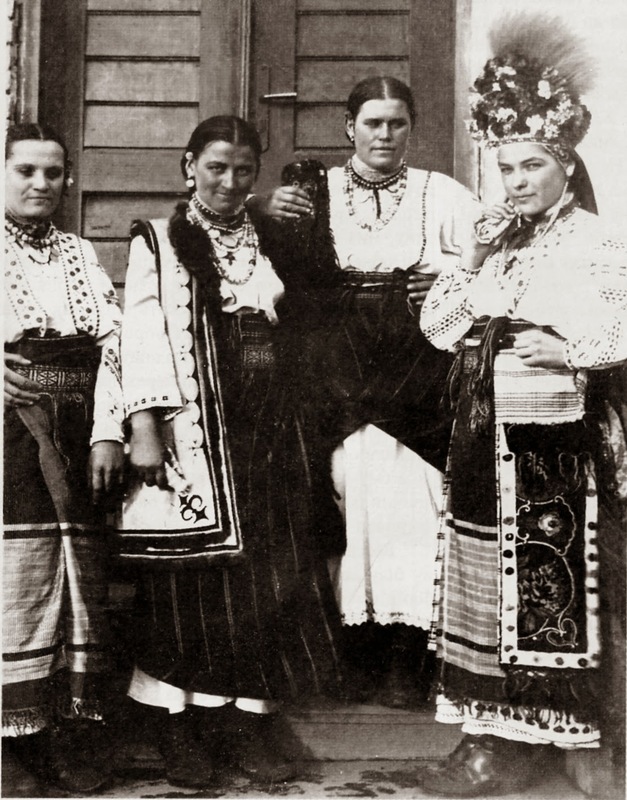 The two girls on the sides of the above photo are wearing a different type of overskirt called the Fota. I will talk more about that later. In the 20th cent. the obhortka began to change; the stripes became wider while their spacing remained the same, so that the black spaces between the stripes became narrower. The horizontal bands on top and bottom became somewhat wider as well. Often they were different, so that it could be worn either way, and so would look like different garments. 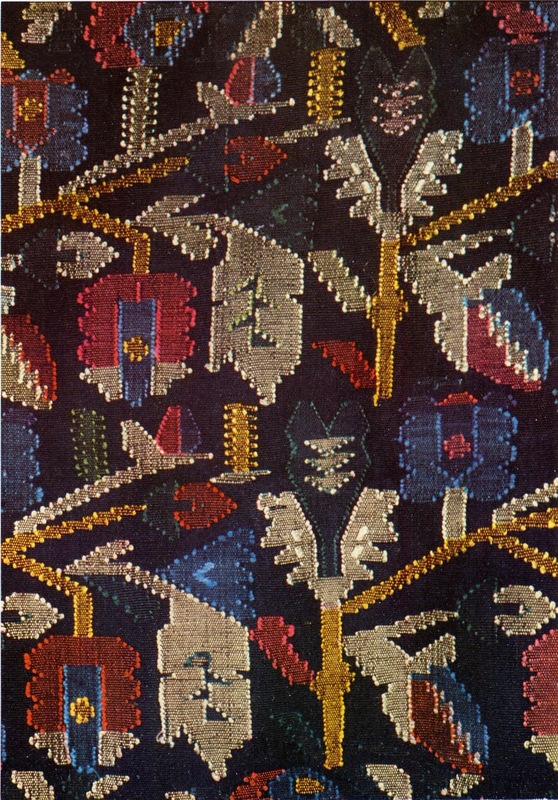 Later on, the stripes were sometimes woven with designs, at first geometric, then later stylized floral designs. Still later, you can find overskirts which have abandoned the stripes altogether. This photo above was taken in the 1930's. You can see that under the influence of city fashion, sometimes the hem was shortened. This was taken to further extremes in the 1960's. More recently, there has been a tendency to go back to the longer hems. 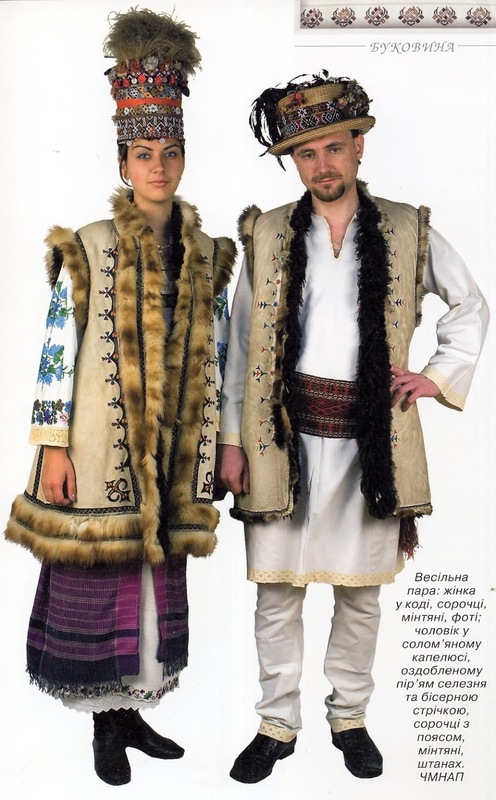 Because the population of central Bukovyna, around the border, is ethnically mixed, you will find Romanian influence, and in fact, the costumes of the Romanians and Ukrainians of that area are almost identical. 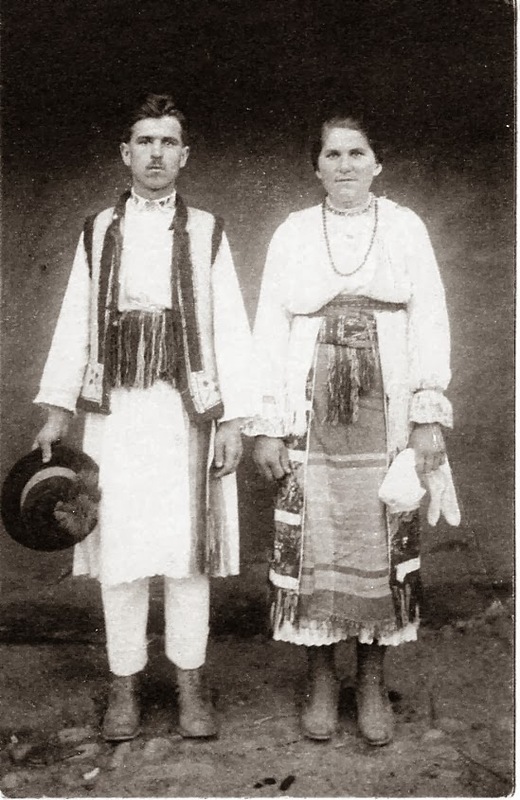 But one style of obhortka, which features an ornamental band around the hem, which then turns the corner to come up the front is undeniably a result of Romanian influence from further south, as it greatly resembles those worn in Muntenia. 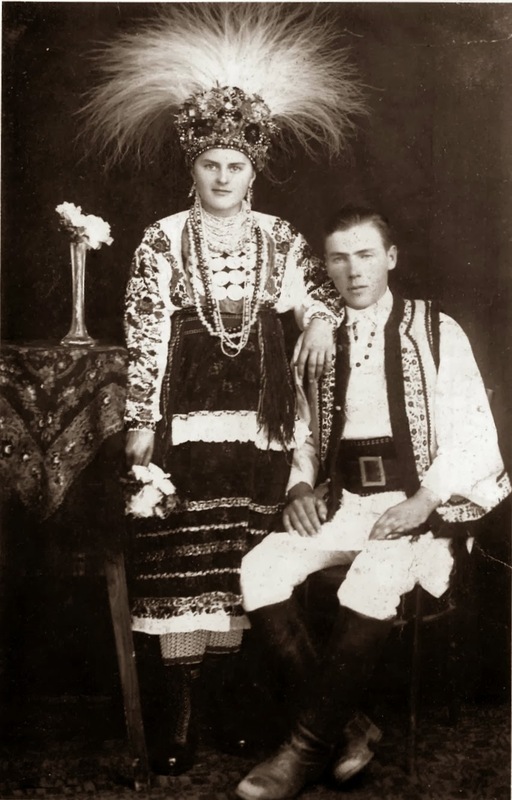 You can see one in this photo, which i believe is of a Romanian couple. You will sometimes see Ukrainians wearing this today as well. 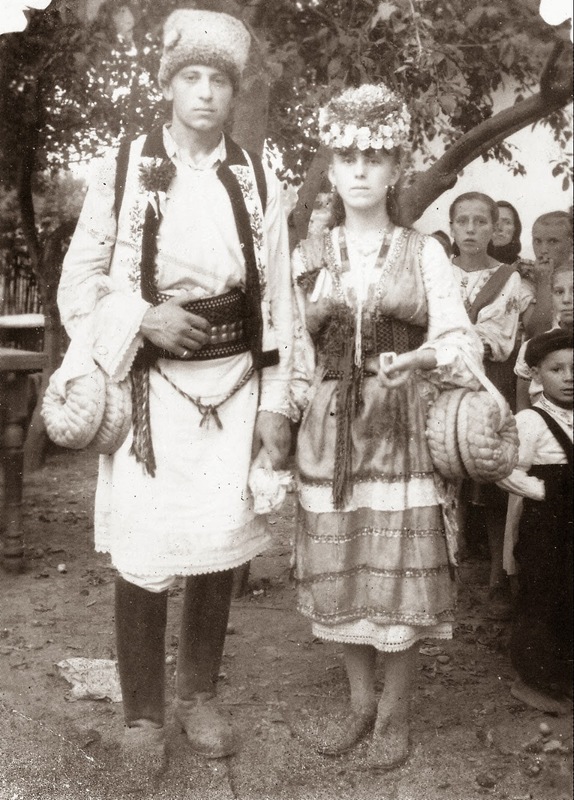 This type of obhortka is woven thinner and is worn shorter, so is usually not tucked up. Here is a video of the popular Bukovynian singer, Sofia Rotaru, she is of Romanian origin but here is singing in Ukrainian. 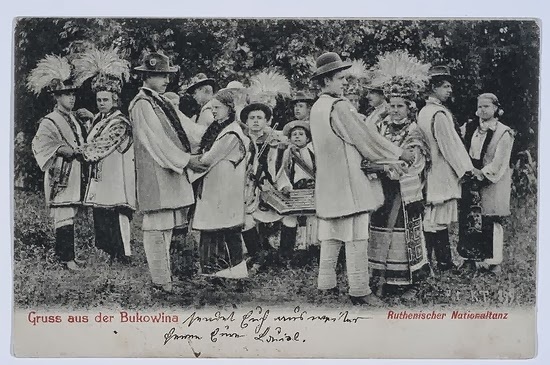 She is shown visiting Bukovynian peasant houses, and trying on various costumes of the region. The one she is wearing at 2:54 is from central Ukraine, the one at 2:48 looks very Romanian, but is not from Bukovyna. 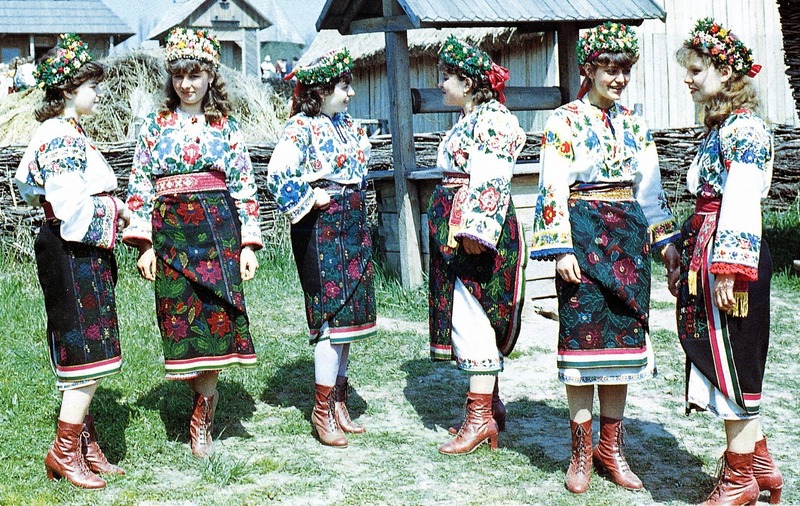 The second type of overskirt used in Bukovyna is called Fota. It appeared around 1850. Here is a drawing by Kul'chytska done in the early 1930's. 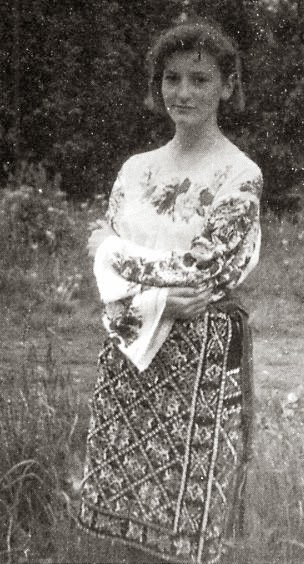 Also notice she is wearing two kerchiefs, a large black one tied in back, and a small white one worn under the chin and tied on top of the head. 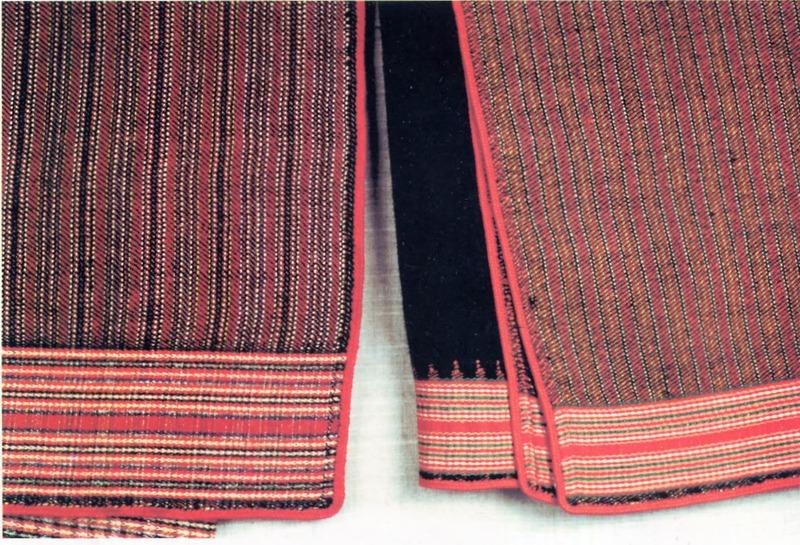 The fota was also woven of wool, but was thinner and more flexible than the obhortka. It resembled a thin bedspread. It was just barely wide enough to wrap around, and had little or no overlap. It was about the same height as the woman, so was worn doubled over, or sometimes cut in half. It had the warp gathered into tassels at the hem, and featured wide horizontal stripes. The fota was worn in three different ways. The first way is by itself, as you see in the above three images and on the left in the image at the head of the article. The second way of wearing a fota is with rantukh. 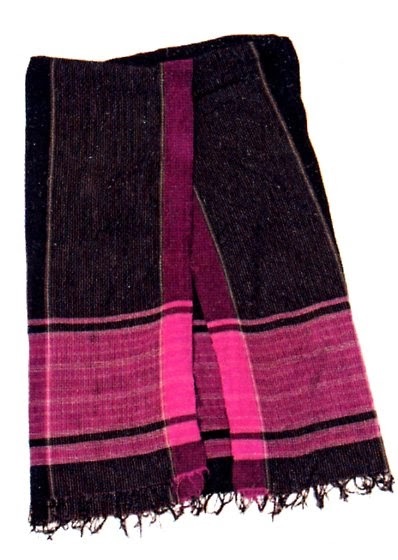 Take a checkered shawl with fringes, fold it on the diagonal, and tuck it into the sash in front, over the fota. The girls in the first photo are from Kitsman. The third and apparantly the most common way of wearing the fota is with fusty or kryla; 'wings' .The 'kryla' are kerchiefs which are folded in four lengthwise and tucked under the sash from underneath. 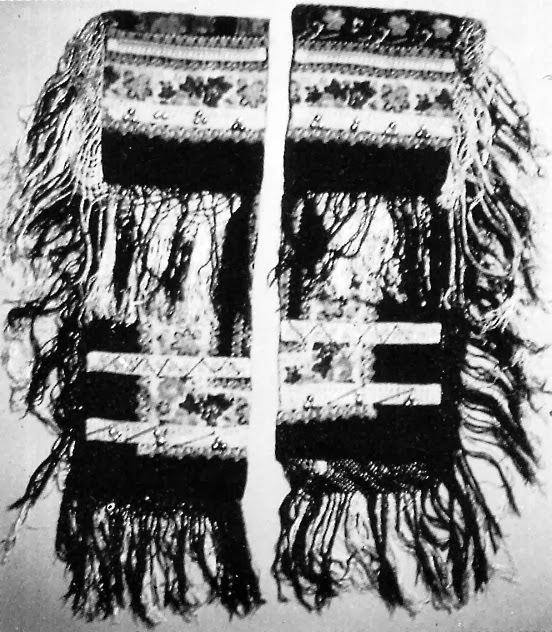 Often this was a second sash worn over the first one which secured the fota.One was worn on either side, or a kerchief would be cut in half, and each half sewn down in this form permanently, which many times was ornamented with ribbons, galloon and perhaps beadwork, and the top folded over and sewn to be able to slide over the sash. 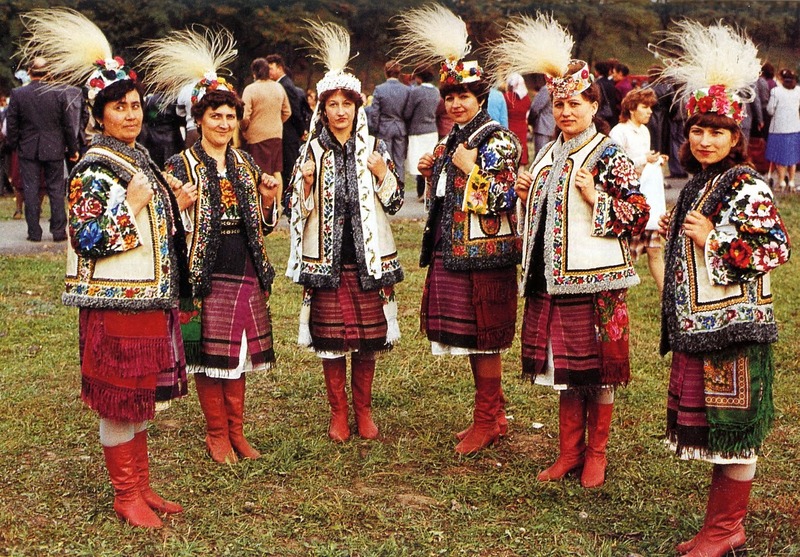 These provided movement while walking or dancing which was absent when wearing the tightly fitting obhortka or fota. 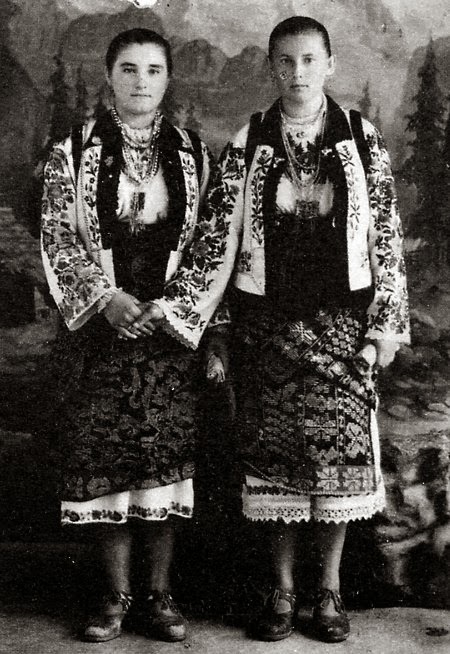 These were also sometimes worn with the obhortka. 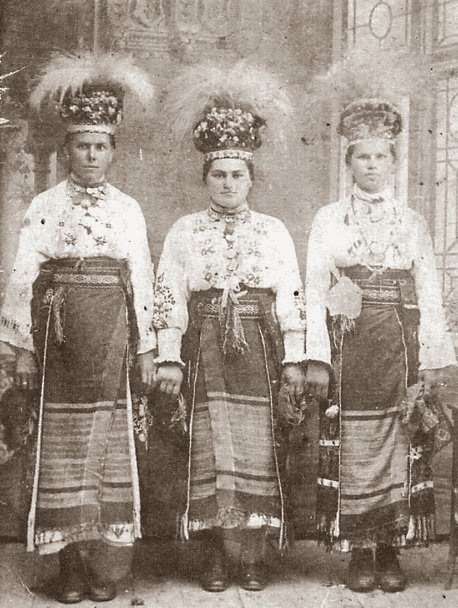 The third type of overskirt worn in Bukovyna is called riklia. This is found in two forms. Originally it was apparantly a bodice which opened in front and had a gathered skirt attached. 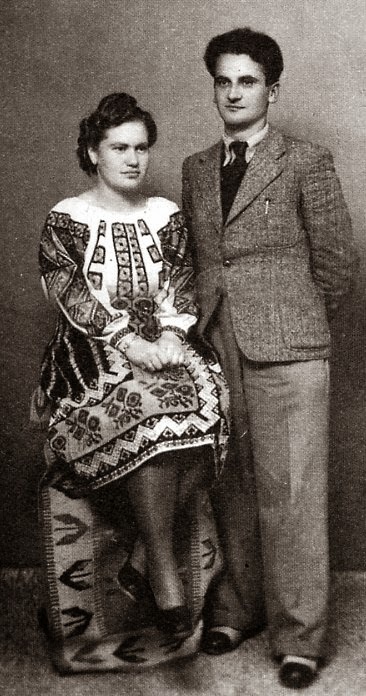 This is perhaps an intrusion of city fashion, or maybe has some connection with a similar garment worn in parts of Russian/Soviet Moldova, although that seems unlikely. This form has almost completely disappeared, today being found only as part of the wedding costume of the village of Toporiwtsi. 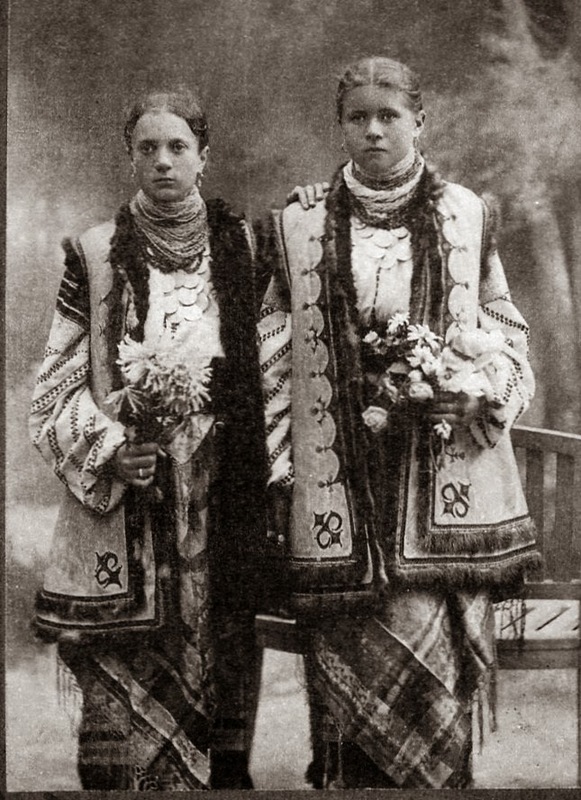 The second photo is of a wedding in Toporiwtsi in the 1040's. In the 20th cent.in most places the bodice disappeared, and the riklia takes the form of a gathered skirt. This makes the entire costume look much more generic, but this garment has the advantage of being easy to make, because it is made of commercially available cloth and does not need to be home-woven, and it provides a satisfying swish when moving. 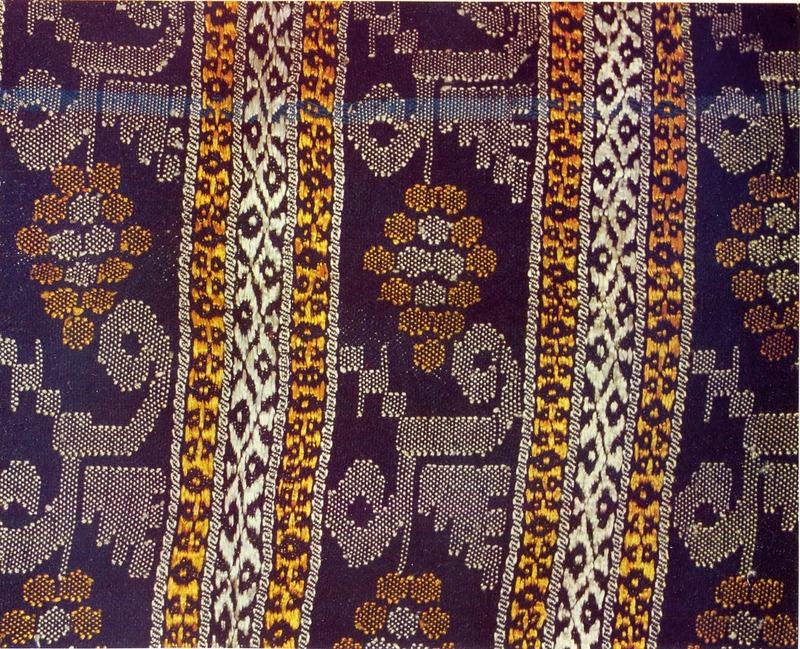 It is made of either solid colored cloth or a floral print, either or which may be decorated with ribbons or bands of lace. 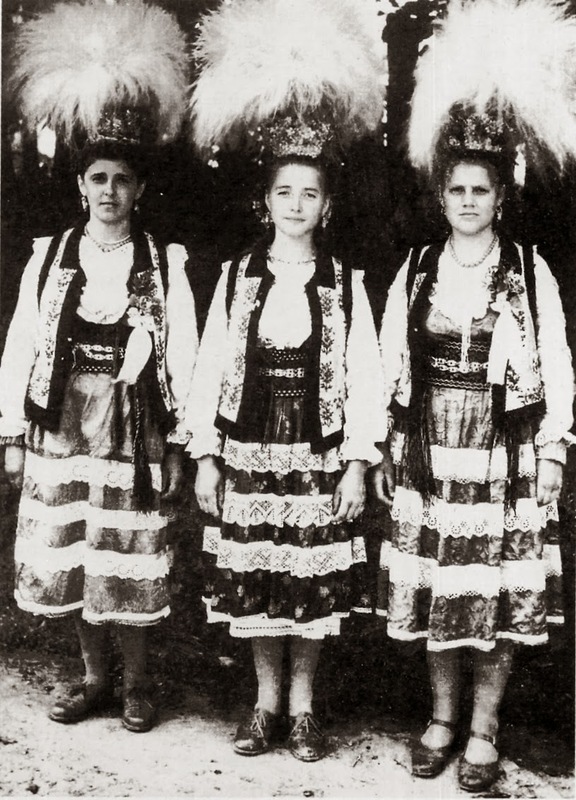 Today, all three types of overskirt can still be found in Bukovyna.